The most popular site to see in Athens is the infamous Acropolis, which means ‘high city’ in Greek. Many Greek cities have an acropolis, originally built to protect the people and also to store valuable monuments. However, the Acropolis in Athens is by far the most impressive. 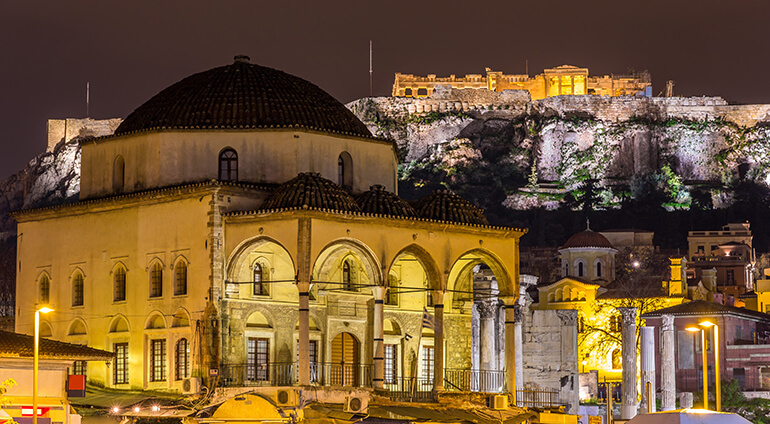 The Acropolis is a UNESCO World Heritage Site and boasts spectacular views of the city. Head up the pedestrianized streets and admire the amazing sculptures and examples of ancient architecture. The Acropolis also houses the Parthenon, an iconic building that was first built in 477 BC as a tribute to the goddess Athena. Another must visit site is the Temple of Olympic Zeus. See the ancient ruins of a beautiful temple that was once one of the biggest temples in Greece. This ancient temple used to have 104 columns that reached 14 metres high. The Panathenaic Stadium should also be on your travel itinerary, it dates back to 330BC and is made of marble. The very first modern Olympic Games were held here in 1896, making this a very special stadium. Those with an interest in the history of the Olympics will particularly enjoy a visit to the Panathenaic Stadium. Mount Lycabettus is also worth a visit, it’s a limestone hill in Athens that sits 277 metres above sea level. It’s another brilliant place to get wonderful views of the city. You can walk to all the main points of interest, thanks to the Archaeological Promenade. This is a 2.5 mile long pedestrianised walkway that links up cities most impressive archaeological sites.